This Sunday, 1st April, is Easter, and of course that means the Easter Bunny will be working overtime on Friday afternoon on the brunch circuit! 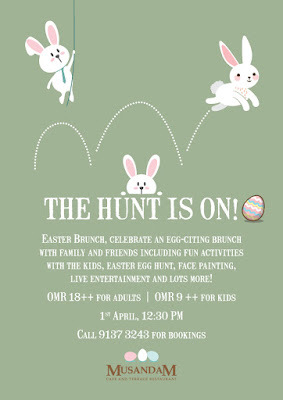 The InterContinental have a number of Easter events going on this weekend, and their brunch is a great one to go to. Both indoors and outdoors, spilling out onto their lawns, during the afternoon the sun moves past the hotel and the gardens where the brunch is held is mostly in the shade - which means its great for kids to run around and you don't need to stress so much about sun-cream and such. 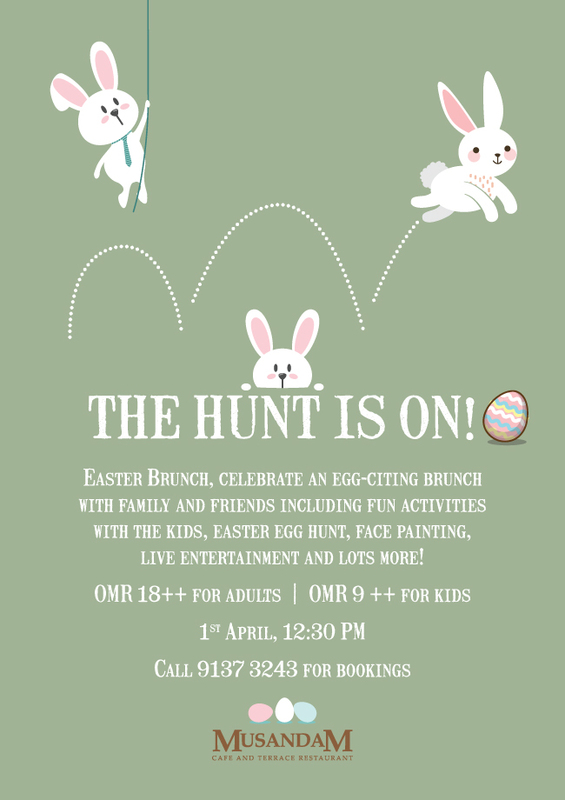 I personally really like it for my kids, its definitely a very good family option for brunch in town. Adults (over 12) RO 18++ (beverage package is an additional RO 8++ if you are that way inclined) and kids (6-12) are RO 9++. The brunch starts at 12:30pm (booze from 1:30pm) - you can make bookings (which I advise you do, it'll be busy and might not be space if you just rock up on Friday). 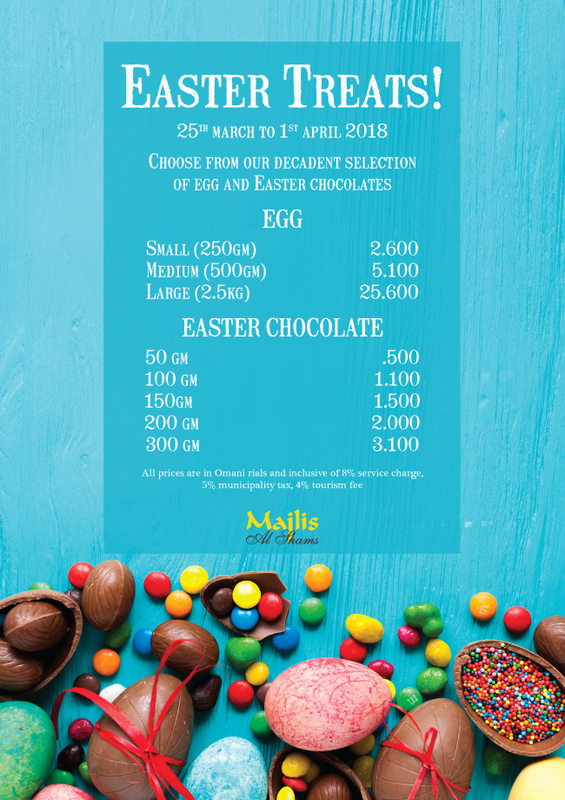 In addition to Brunch, the Majlis al Shams are offering Easter Chocolate and Eggs until Sunday for the prices shown above. Personally I'm intrigued by how large a 2.5KG chocolate egg actually is! You can place orders by calling 9137 3243. 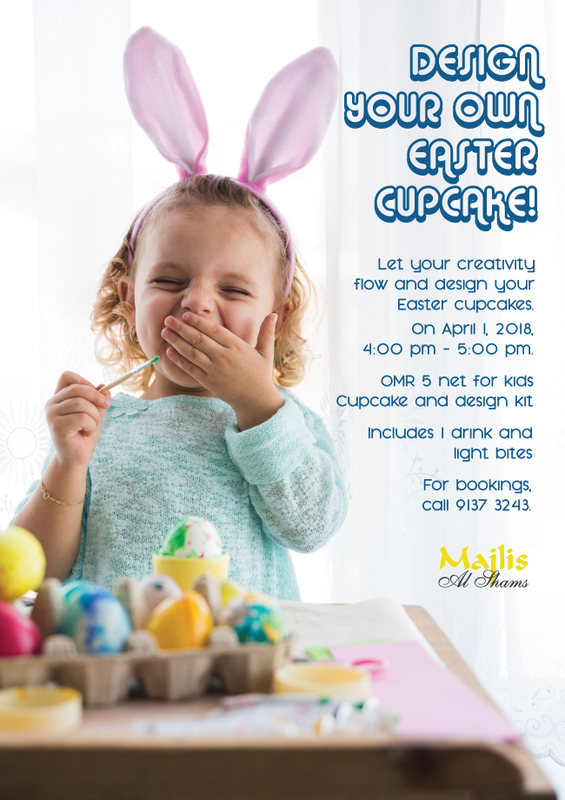 And finally, a special one for the little ones, on Easter Sunday (1st April) between 4 & 5pm for RO 5 net you can let your kid decorate their own cupcake, the price includes a drink and a light bite! You can make bookings by calling 9137 3243.